There are several options to choose from when marketing your daycare business. If finances are limited, a good marketing campaign can be accomplished with some creativity at a fairly low cost. If you're fortunate enough to have an advertising budget, you will be able to get optimum results. Word-of-Mouth is a perfect advertising tool for marketing your daycare. It's effective and it's free. It's the perfect tool, but you need to put effort into spreading the word. 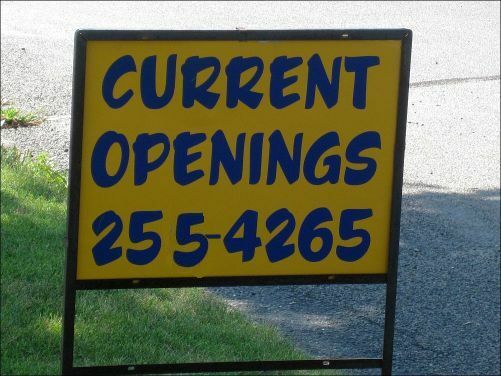 Tell everyone you know and everyone you come in contact with that you operate a daycare and have openings you’re looking to fill. A Newspaper Ad is another option. Keep in mind that when you place an ad in the newspaper it will be alphabetical. Spend some time coming up with a creative ad that will place you at the beginning of the “Daycare” section. You also want to make the ad original so it sticks out from all the other daycare ads and gets you the call. The Internet has both free and “paid for” websites. Build a website to promote your daycare. Ask your existing families or past families to write a testimonial to post on your website. Join Mom Groups, Resale Groups and/or Garage Sale Sites in your local area. Post regularly to get your name known to young, potential families. Place an ad on Craigslist. It's free to post an ad and many people are now choosing this option to look up classified ads. You can post every 48 hours to keep your ad running at the top of the list. Submit your daycare business to the search engines such as Google, Yahoo and Bing. When someone searches the internet for daycare in your area, your business will come up. Have a satisfied customer leave a comment under your business name to help boost your rankings with the search engines. Edit your Signature File for your e-mail. After your name, add a line to let everyone know you have current openings in your daycare. A Lawn Sign is a necessary marketing tool. Once you make the initial investment of a sign, it’s a free way to advertise every time you need to. Invest in a durable, professional sign. The sign you place in your yard will be the first contact most people have with your business. It’s important for this sign to tell people that you take your business seriously. Referral Agencies are another free way to advertise your openings. Check your county’s local resource and referral program (CCR&R) and inquire about other referral programs in your area. Join a Local Daycare Association. This will not only help get the word out when you have openings, but it always helps to mingle with people in your chosen profession. Network with Other Providers. Introduce yourself to other providers in your area and use each other for referrals. Keep in contact with each other. If one provider is full and receives a phone call, they can refer the family to a provider with an opening and vice-versa. A Flyer or Brochure that you created on your computer can be distributed in your neighborhood mail boxes, posted on community notice boards or distributed in child-laden areas such as the cars in a church parking lot, the laundry mat or the grocery store. Be sure to check your local ordinances for distributing advertising in this manner. 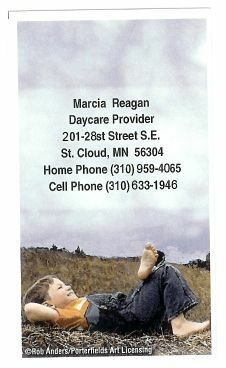 Design a Business Card for your daycare. It's not only a great marketing tool, but when you're able to provide people with your business card, it shows professionalism. Take the time to design a card that is both professional and creative to attract attention when given to people. Carry cards with you at all times to hand to people you come in contact with. Have everyone you know carry your business cards with them. Have Apparel Made with your daycare logo on it. You can advertise your daycare by wearing a t-shirt, sweatshirt or jacket with a logo you designed whenever you are in a public place where children and their parents will be present. You could also have a tote bag made with your daycare logo on it. If you take your daycare children on field trips, have t-shirts made up for each child and have them wear them on the field trip. Donate books to businesses with a waiting room such as doctor's offices, dentist's office or hair salons. Place a large sticker on the inside front cover that says "This book donated by..." with the name, address and phone number of your daycare. Purchase Promotional Items such as pens or frisbees that have your daycare name and phone number printed on them. Distribute them in public places where they will be found by families with young children. We're Looking for S'more Friends! Put a graham cracker, a marshmallow and a miniature Hershey bar in a Ziplock sandwich bag, along with a business card. Put a label on the bag that says "We're looking for S'more friends! Hand out at your local parks and swimming pools. Host an Open House. Invite neighbors, friends and anyone else you can reach out to to come and tour your daycare area. Serve snacks and play games so that any kids who arrive will have a great time and want to come back again. Ask Your Current Daycare Parents to Spread the Word. Like I said previously, word of mouth is an excellent source of marketing. Just be sure to come right out and ask your current parents to make sure you have their help. Offering a finder's fee or a coupon worth a deduction in their daycare fees might help motivate your families to help you. Activity Table at the Park. Set up an activity table, with a sign advertising your daycare, for the kids to play at. When kids approach with the parents to play, hand the parents a business card. Magnetic Sign or Window Detailing. Promote your business on your car. Whether you drive to the grocery store or take the kids on a field trip, you'll be advertising your daycare business. If you opt for the magnetic sign, you can choose to have it on your care when you have openings and remove it when your daycare is full. Contact your local schools and churches. Many churches and schools keep a list of local businesses that would be beneficial to their families and parishioners. Get on as many of these lists as you can. Contact Real Estate Agents in your area. Provide them with flyers or business cards and ask them to hand them out to new families moving to the area. On Halloween, hand out a baggie of treats with your business card attached or included inside. If You Use All These Resources, you will probably be taking phone calls from prospective families even when you don’t have openings. When that happens, be sure to get contact information from the family anyway. You never know when you’ll be getting notified that a family is moving or leaving for another reason. If you can contact recently inquiring families, they might still be looking for a good daycare. Also, when you're taking phone calls because you've been advertising, be sure to ask where they found out about your daycare so you know which marketing avenues are working best. The more of these resources you use, the better the results will be. 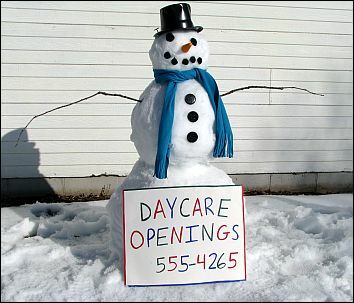 If you have some creative ways to market your daycare business, please share it with us!